FreeBe TV for Mobile is the easiest way to watch TV on your mobile. On mobile it's FREE and simple to register: have a bookmark on your mobile and select a channel to watch. 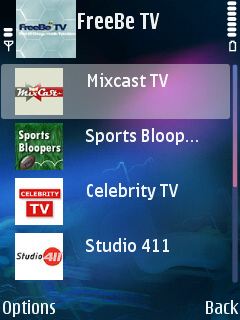 Freebe TV works over wifi or a GPRS and plays on the media player on your handset. Once you have signed up you will need to type the waplink displayed in "My Mobile TV Account" into your devices wap browser. Here are some example handsets show different operating system. FreeBe TV for Mobile is the easiest way to watch TV on the mobile. It's free TV. Once you have signed up you will need to type the waplink displayed in "My Mobile TV Account" into your devices wap browser. * Here are some example handsets show different operating systems which are all compatible with freebe.tv. * To use GPRS you will need to modify your settings, Click a phone below which best suits the type of device you are using to get help with the settings. TVR turns your PC into a full-featured digital video recorder for TV! Watch 3000 Tv channels online! No hardware needed! No monthly fee! Turn Your Computer into an HD Internet TV and Watch over 2,500 FREE Channels. Qweas is providing links to FreeBe TV 1.0 as a courtesy, and makes no representations regarding FreeBe TV or any other applications or any information related thereto. Any questions, complaints or claims regarding this application FreeBe TV 1.0 must be directed to the appropriate software vendor. You may click the publisher link of FreeBe TV on the top of this page to get more details about the vendor.